Bside Condos is a new development by Minto Group located at Bathurst Street and Front Street. Cosmopolitan, vibrant, design-forward. 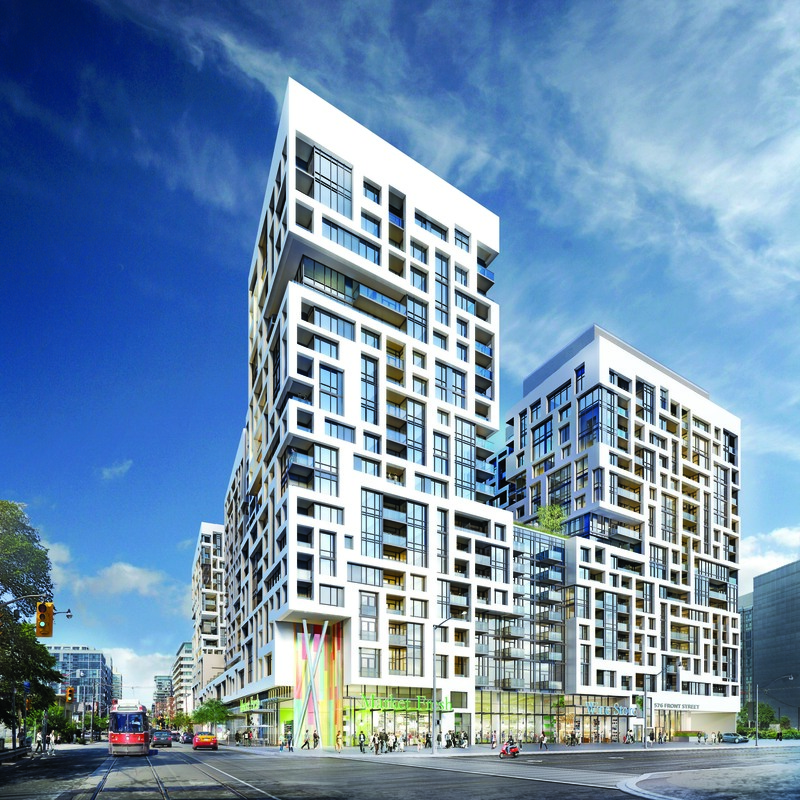 Rising 20 stories, Bside is part of the incredible Minto Westside community at Front and Bathurst. Enjoy spectacular city and lake views and live just steps to the waterfront, amazing shopping and dining, inspiring theatre and culture, nail-biting sports and entertainment. Close to all the amenities you need for live, work and play. Bside is a soaring new landmark that will redefine the dynamic urban community at Front and Bathurst. With an articulated facade of sleek lines and luminous glass, BSide at Minto Westside pays homage to one of Toronto’s original warehouse districts by reinterpreting the architectural style of the area’s heritage buildings. The spectacularly landscaped central courtyard provides residents with a welcome retreat from the activity of the street. Residential suites either face into this quiet urban oasis or face outwards towards panoramic vistas of Lake Ontario, the western horizon and Fort York. All suites feature balconies recessed behind the exterior walls to maximize privacy. Revel in the sleek modernity of its architecture, a strong and welcoming metaphor to this vibrant location just minutes to the water’s edge. Rising above the intersection of Front and Bathurst, Bside offers some of the most spectacular views of the lake and the city. Facing south and west, you are treated to a breathtaking panorama of blue waters and the myriad greenspaces of lakeshore parks and trails. Picture-postcard vistas that define one of the world’s greatest cities. A few steps from your front door is the waterfront, home to a multitude of attractions and activities. Explore the eclectic boutiques and trendy eateries of Queen West or enjoy a season opener in the Entertainment District. Check out the latest styles and trends in the Fashion District. With the TTC at your doorstep, access to the Gardiner Expressway, and Billy Bishop Island Airport just a five-minute walk away, getting around the city or getting out of town is quick and convenient. Soaring ceilings, open concept layouts and natural light from expansive windows lend an aura of spacious urban luxury. Sleek gourmet kitchens, luxurious master retreats and gorgeous features take elegant living to a new height. Bside has taken the good life and then raised it a few notches through brilliant design and inspired finishes. Pricing for available units are starting at $264,990 and go up to $682,490. VIP sales are underway, so contact me asap to get to the front of the line.